For a new dieter starting out on a low-carb high-fat diet, the foreign qualities of the diet can make it seem complicated. After a lifetime of being told to eat a certain way, and avoid certain types of foods, the selection of permitted and prohibited foods on the low-carb high-fat diet can feel almost arbitrary. You’re able to eat cheese, but you can’t eat pizza. You’re allowed to eat hamburgers, but you can’t have meatloaf. You’re encouraged to have lettuce, but you should avoid carrots. Unless you understand the logic behind some of these rules, it can be very confusing trying to figure out what you can and cannot eat. One of the most complex parts for me when I started was the proper selection of vegetables. Every diet I’ve been on, including the low-carb high-fat diet, emphasizes the importance of eating vegetables as a large proportion of your overall food intake. However, on a low-carb high-fat diet, there’s a set of vegetables that you’re supposed to avoid because of their high sugar content. Although a lot of these vegetables may be considered unlimited foods on many other diets, they’re strictly limited or outright prohibited on a low-carb high-fat diet. One of the things that makes this so confusing for dieters is that some of these vegetables are also very low in calories. One of the facts that you have to get used to on a low-carb high-fat diet is that calories aren’t the point. While we want to benefit from the vitamins and roughage that come from eating vegetables, along with the high water content and other possibly unknown qualities from their natural combination of nutrients, we do want to avoid spiking our blood sugar. The rule of thumb I have come up with that makes sense when choosing vegetables is to avoid most vegetables that grow below the ground, and focus on the ones that grow above the ground. While this is not a hard and fast rule, it does cover the vast majority of cases, and can make choosing a little bit easier when you’re starting out. One of the best examples is the potato. While this is definitely a vegetable, it is one that most diets would tell you to limit. Although some diets would say that it’s the butter and salt you have to put on a potato to make it palatable that is the problem, we know that for low-carb high-fat dieting, the problem is the high starch content. The starch is obvious in a potato, and starches are immediately converted to sugar in the body. The glycemic index of the potato is also very high, as is the glycemic load of a typical serving of potatoes. Another obvious root vegetable to avoid is the beet. Not only are beets very sweet to the tongue, they’re actually used as a source of sugar when refined. As a kid, I remember discovering beets at the salad bar of one of my favorite family restaurants. I was amazed that something this sweet and candy-like could be considered part of a salad. I used to love mixing canned beets with cottage cheese, and watching how it turned a beautiful huckleberry purple. But of course, at that time I had no idea what the impact of so much sugar was on my system. So it’s not unexpected that we would want to avoid potatoes and beets. 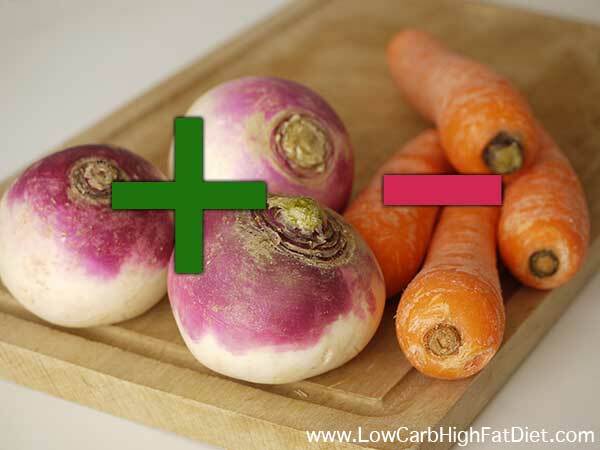 But one of the most surprising vegetables to avoid on a low-carb high-fat diet is the carrot. Carrots are very low in calories, and the typical portion may be relatively small, but if you think about the sweetness of a cooked carrot, you’ll realize just how much sugar and starch there actually is in one of these. Especially with modern agricultural techniques, industrial farms in the United States have developed monocultured strains of carrots to meet customer demand that are incredibly high in sugar. There are some root vegetables that are safe to eat. For example, celery root and jicama are generally considered acceptable on a low-carb high-fat diet. Other candidates are turnips and radishes. All of these exhibits the crunchiness that we like to associate with a root vegetable, but without the cloying sweetness. Of course the vegetables to emphasize on a low-carb high-fat diet are the dark leafy ones. That includes everything in the crucifer family, whether it’s green or purple cabbage, cauliflower, broccoli, Brussels sprouts, etc. Spinach and lettuces are also excellent, and provide a lot of vitamins along with the bulk and fresh taste to support your diet. Additionally, some more exotic greens such as kale and mustard greens are becoming popular. Personally, I don’t like their bitter taste, but it’s a matter of choice for each of us. So be adventurous in the vegetable aisle, but pay attention. Not everything there is fair game on a low-carb high-fat diet. However, you may find inspiration in the variety of acceptable choices as you explore.